New Year's Eve in the guest house. Šumava-Zadov. Modern rooms with sanitary facility, color TV, refrigerator, equipped kitchen, restaurant with terrace … More » . Bowling bar. A place for your relaxation and regeneration. Starting point of cross coutry tracks in National Park Šumava. New Year's Eve in the hotel. 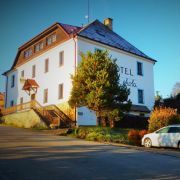 We offer pleasant accommodation in a family hotel in Hořice na Šumavě, the Gate of Šumava Mts. Accommodation for … More » reasonable price for visits of Lipno Dam and Český Krumlov. Ideal for families with children, cyclists or tourists. Children's corner. We offer thematic stay packages.